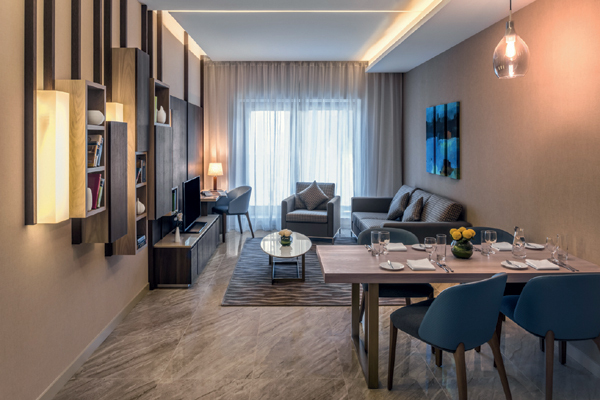 Mövenpick Hotels & Resorts is gearing up for the opening of a new hotel apartment tower in Downtown Dubai. Expected to open by year end, the 244-key property, which will be within walking distance of the world's tallest building - Burj Khalifa - and the Dubai Mall, will become the operator’s sixth property in the emirate. The hotel also offers an all-day-dining restaurant and a pool lounge, as well as an outdoor swimming pool, gym and sauna. Great food throughout the day is what one can expect in the hotel's all-day dining restaurant at Mövenpick Hotel Apartments Downtown Dubai. Natural light fills up the airy interiors where creatively prepared feasts are enjoyed. Along with an à la carte menu, the restaurant features an extensive salad bar with wonderful variety. Fresh honeycomb and on-demand freshly juiced concoctions are favourites during breakfast, while evenings are ideal to try regional specialties. The restaurant also serves coffee and fragrant teas alongside an indulgent assortment of freshly baked pastries, cakes and savoury treats throughout the day. Check out our Power Bites kids menu and Mövenpick’s popular ‘Go Healthy’ options.